We finally launched on Wednesday and are now afloat and ready to leave Ayvalik. We found Lynn Rival in good condition after the winter, just a bit dusty, and we spent almost 3 weeks getting her ready for launching: scraping the bottom, sanding and then painting with two coats of primer/undercoat and two coats of anti-fouling. Here's Paul in action at the sanding stage. Before launching we stayed in a local hotel and now know Ayvalik well. Out of the high season, it's a pleasant working town, with friendly and helpful people. We've been enjoying eating out in the local restaurants and cafes, not always with total success as English is not widely spoken. One day Paul thought he ordered a beer but ended up with a cup of hot orange drink. We also keep being 'treated' to a plate of small, sharp plums that are in season at the moment. They must be an acquired taste, and are a sharp contrast to the usual ultra-sweet Turkish pudding offerings. 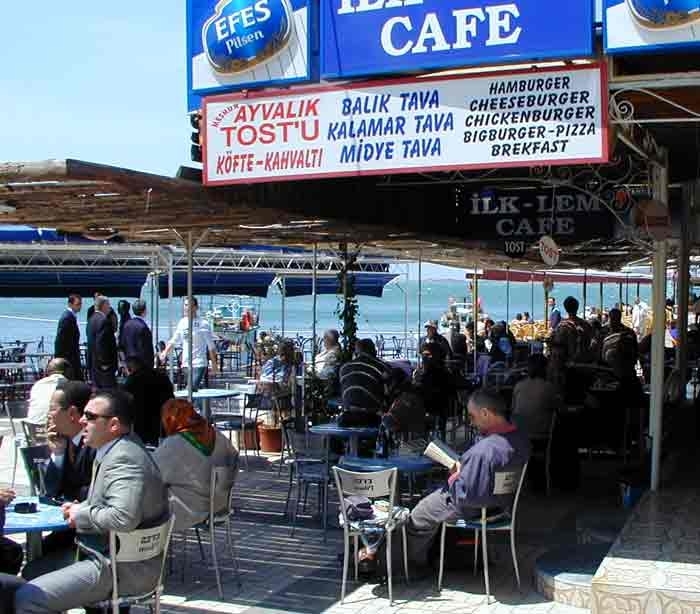 Here is one of our favourite cafes on the seafront. The weather has been mixed, often sunny and warm but sometimes windy and cool. Inevitably the wind strengthened for the days we painted the hull and made it harder-going. We've also had a couple of days when it has rained for a few hours but not heavily. 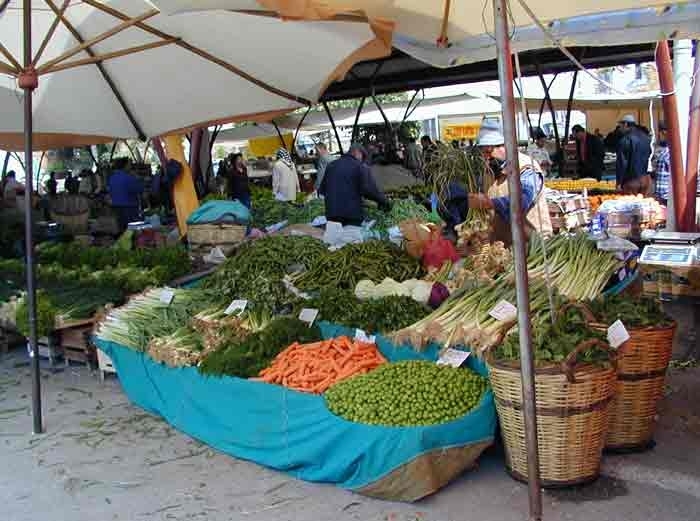 Market day on Thursday is the highlight of the week, when everyone comes to town from the surrounding district. The town is also now getting busier at weekends, and boat trips to the local islands are popular as well as sitting in the seafront cafes eat cake, drinking tea and watching the world go by. Since arriving the boatyard has been fairly busy, with a number of other foreign boat owners around as well as locals. There have also been quite a few yachts coming and going in the marina, including some who are participating in the Eastern Med Yacht Rally, which started in Istanbul and had a short stopover here. The last week or so has got busier. We're now berthed alongside Andrew and Janice of Rascal of Rhu, who are also CA members. There are quite a few Dutch registered yachts coming and going, and a couple of US-owned, one of which we met briefly in the Sea of Marmara last year. Paul and Chris on New Dawn passed by and saw us launch. We were able to catch up with them since we met in Aigina last summer. Our Turkish is getting better. Fortunately the local chandler speaks English and is helpful but even so it can be difficult and time-consuming to get what you need for boat maintenance. Our order for antifouling paint got lost on the way from Istanbul and took a week to arrive. We couldn't find a supplier of overalls and tried to persuade a local tailor to make us some but he was too busy so we ended up buying cheap trousers and sweatshirts. We've given up on White Spirit, which we are told isn't available in Turkey. More importantly, as we found we needed to replace a seacock, it seems that Blakes seacocks are not imported here so have had to use an inferior substitute. The marina have been very accommodating. Because we took off all the old anti-fouling and sanded back to the bare hull, we needed time to put 4 layers of paint on the areas where the props were. They agreed to lift the boat, move her forward and sit her down again on the cradle, enough to expose the patches at no extra charge. Here' she is, including polished topsides, almost ready for launching.